Wireless sensor networks are attractive solutions that can be used in healthcare and sport performance monitoring applications which will enable constant monitoring of health data and constant access to the patient regardless of the current location or activity and with a fraction of cost of the regular face-to-face examination. Such a system is particularly useful in the case of in-home assistance of the elderly and rapid repatriation of recovering patents to their own homes, as well as for smart nursing homes, clinical trials and research augmentation. It was estimated in 2012, that wireless sensor solutions could save $25 billion worldwide in annual healthcare costs by reducing hospitalisations and extending independent living for the elderly. Current wireless sensor solutions are limited in that they do not provide the means to overcome obstacles and shadowing of propagating radio waves and also reduce the effect of interference in congested radio environments. The project will conduct research into new techniques and methods that combine both antenna and radio propagation engineering with networking and smart frequency agile communication systems. It aims to develop underpinning capabilities for an advanced low-power wearable antenna elements coupled with intelligent control algorithm capable of sensing and understanding the dynamic human body and dense indoor radio environment. Wireless monitoring of patients with critical illnesses can be taken as an example to demonstrate the benefit this technology will bring to the healthcare services. In dense hospital (or care homes) environments, there are many wireless standards present and radio communication is faced with many obstacles. In cases where there is no clear path between the patient's sensors (ECG, Blood pressure, blood sugar level, etc.) and the access points or the carer's receiving units, for example when a patient is laying face-down on a wireless sensor monitoring the heart, the communication link can be lost completely - a risk which is unacceptable to the healthcare profession. In cases when there is a lengthened radio propagation path from shadowing, the wireless sensor requires more power to communicate with the access point. For a system consisting of a number of independent sensors monitoring different vital signs, the power consumption can be significant enough to make the approach impractical, particularly for the elderly, whose reliability to recharge the power source cannot be guaranteed. Proposed in this project is a cooperative communication network of on-body wireless devices in which individual antennas in the network can adapt their radiation mode to switch between communicating with off-body units or using neighbouring devices on the same body. Appropriately configured, such a system will ensure that the data from the body-worn device can be communicated to the local base station or access point either directly or via one or more onbody sensor hops. So regardless of degree of shadowing - the system will autonomously find a communication pathway around the body to an antenna with the lowest path loss to the access point, hence minimising power consumption. The ability of the system to autonomously detect an uncongested part of the available radio spectrum for the communication link further adds to improved battery life. 'Dial-a-Molecule' is a current EPSRC Grand Challenge. It seeks to tackle questions of the kind: 'How can we reliably predict how to convert one molecule into another?' 'How can we carry out a series of reactions sequentially?' and 'Can we invert modular reactions and/or reactors which can be linked to a myriad of ways to provide complex synthesis?' It has been estimated that achieving the reality of 'Dial-a-Molecule' may take 20 - 40 years to realise. The adventure of this project is to investigate the very real possibility of dramatically bringing this time-frame forward to 5 years distant from now by answering these questions through activation of specific chemical bonds in any given molecule. The consequences of being able to do so would be profound and far-reaching! - new reactions, potential for complete control of outcomes in product synthesis e.g. in C-H activation/oxidation. How can this be done? - by exploiting very recent state-of-the-art developments in electronic engineering to generating high-power terahertz (sub-millimetre wavelength) radiation and to bring it into the world of synthetic organic chemistry. The apparatus that embodies this sophisticated development is called a vector network analyser. Its special features, that are vital to supporting the aims of solving long-standing problems in organic synthesis, is that it generates and receives (phase) stable, widely-tunable radiation spanning many octaves. The resolution in tuning is hyper-fine, being on the order of a million-fold higher than conventional spectrometers (that are broadly based around thermal sources of radiation for their measurement operation). These unique features of the vector-network-analyser offer the potential reality for 'dialing' into the energy required to activate a given chemical bond in a molecule and not, say, an immediate neighbouring bond! Importantly the vector network analyser can be operated to immediately scan the aftermath of a stimulated reaction to investigate what reaction products may have resulted and in what quantity. The activation and scan events may be variably-controlled to range from a second to sub-microsecond time scales as required. An important consequence associated with being able to selectively trigger selective reaction processes with high precision is to eliminate the yield of waste products. Stages in conventional organic synthesis typically yield waste that is 1000s of time the mass of the desired product. Eliminating this waste translates into reduced consumption of energy both in generation and disposal. Over the 18 months of this project the burden of work will be: to design and manufacture a reaction vessel that simultaneously satisfies radiation and chemical constraints; and to systematically trial the programmable capability of the vector network analyser in service of promoting 'dialed' reactions of organic synthesis. Antennas control, direct and filter electromagnetic waves and form a key component of the microwave wireless communications revolution . Future developments will climb the frequency spectrum to embrace millimetrewaves, where for example 60GHz offers short-range communication with Gigabit bandwidths. Microwave wireless communications will move from the largely social voice/text media to a wide range of monitoring applications via sensor networks, and patient health telemetry /monitoring /control via on-body and in-body sensors and actuators will be a major user of this technology. Indeed medical and healthcare application of microwaves for treatment and communication is rapidly becoming a major worldwide growth area. Electronic implants to aid patents on a permanent or temporary basis are also seeing major growth, with international companies investing massively in R&D. Coincident with this technology there has been a massive increase in healthcare provision in the UK combined with an associated revolution in how treatment is offered to the patient. The simplicity and utility of technologies such as UWB, Bluetooth, GSM and 3G with voice, data, and streaming video offers much to healthcare. In the field of imaging short pulse microwave UWB offers non-ionising screening technology for cancer detection, whilst Terahertz (THz) radiation has enormous potential for a broad range of applications from health care to security, with spectroscopic materials analysis and atmospheric sensing of special scientific importance. It has already proven to be a valuable tool for applications including chemical spectroscopy (to detect biohazards and label-free sensing of genetic sequences), security imaging, non-destructive testing, cutaneous imaging and wireless communication at data rates exceeding 10Gb/s. This grant aims to focus our antenna, on/body propagation and metamaterial expertise into these areas by deploying short to medium term PDRA effort on feasibility studies or proofs of concept, which, if successful, would lead to full proposals being submitted. As China is set to be the major source of global economic growth for the next decades, it is clearly essential that the UK is linked into and can benefit both from the excellent research that is being fostered in China (China's engineering research is already in the world top three for impact, for example, and second in Physics, with nearly 20% of world papers), and from the potential for the exploitation and implementation of that research. Queen Mary has an outstanding track record of working in collaboration with Chinese partners. Our ability to collaborate successfully with China HEI's is best evidenced in our long-term award-winning partnership with China in teaching providing IET-accredited joint (dual) degree programmes in telecommunications with BUPT, but also through institutional partnerships and research centres, and through numerous individual research collaborations. Our track record of working with industrial partners in China builds on the Innovation China UK (ICUK) programme which was the first UK-China collaboration to promote joint innovation and knowledge transfer. Launched in 2007, the £4.9 million HEFCE and BIS-funded initiative, was led by Queen Mary and with the end of the original funding ICUK has been embedded into Queen Mary's business development unit. The overarching aim of the project is to develop sustainable research collaborations with key and significant Chinese partners. We will build on the strengths of both traditions and of the partner organisations to ensure long-term sustainability through appropriate funding streams, while recognising the significant barriers (both cultural and operational) that exist on both sides. 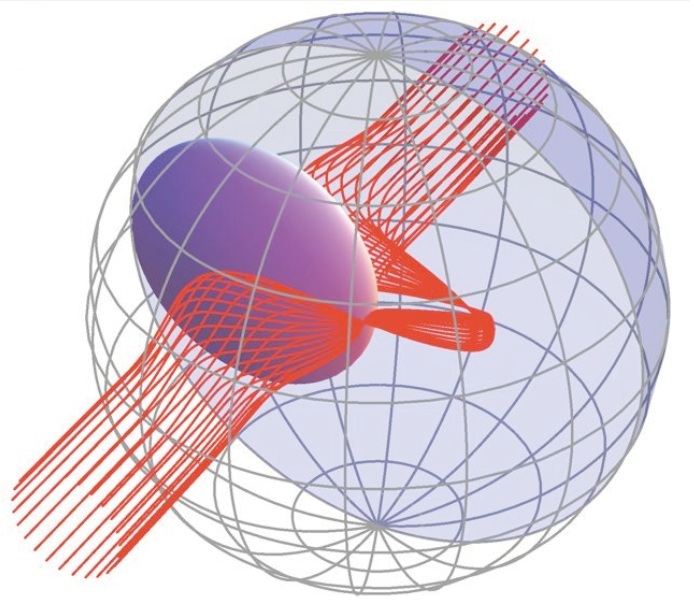 The idea of spatial transformations (ST) is to provide entirely fresh solutions to the distribution of the spatial arrangement of materials so as to enable new ways to manipulate the emission, propagation and absorption of EM radiation. This goes far beyond what can be accomplished with traditional materials in the form of lenses and mirrors, requiring both conventional materials and also those with properties that do not exist in nature (i.e., metamaterials). ST are at the heart of exciting ideas such as invisibility cloaking and optical illusion. To make the required exotic materials in large quantities, modern fabrication techniques will be needed, including the use of nano-composites and graded-index coatings. The material palette can be further widened by the inclusion of active metamaterials and superconducting dielectric composites. As an example of the type of application one may envisage, there is an increasing demand for wireless communications anywhere and at any time. However, many environments such as offices and crowded shopping centres contain obstacles and scatterers that lead to signals being 'confused'. QUEST solutions will place the UK in a leading position in this exciting area, pushing the conceptual boundaries whilst at the same time exploring the practical problems of design and manufacturability.The Programme Grant will bring together a new grouping of leading UK experimentalists and theorists from physics, materials science and electronic engineering to work together on the exciting opportunities and challenges emerging in the area of spatial transformations (STs) and electromagnetism (EM). The potential of the underlying ST approaches however have much wider applicability than cloaking alone, in arguably more important applications that span communications, energy transfer, sensors and security. However, theory and concepts are outstripping practical demonstration and testing, leading to a mismatch in what may be theorised and computed and what can be realised for impact in society and commerce. We contend that the timing is now ideal for UK theorists, modellers, manufacturers and engineers to work together to maintain the UK strength in this field, with a clear focus on the reduction to practice and demonstration of potentially radical new concepts and devices.